Want the taste of cake batter without having to whip up a whole cake? 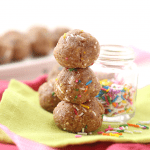 These Cake Batter Energy Balls are a lightened-up and high-protein snack recipe that tastes just like the real thing! 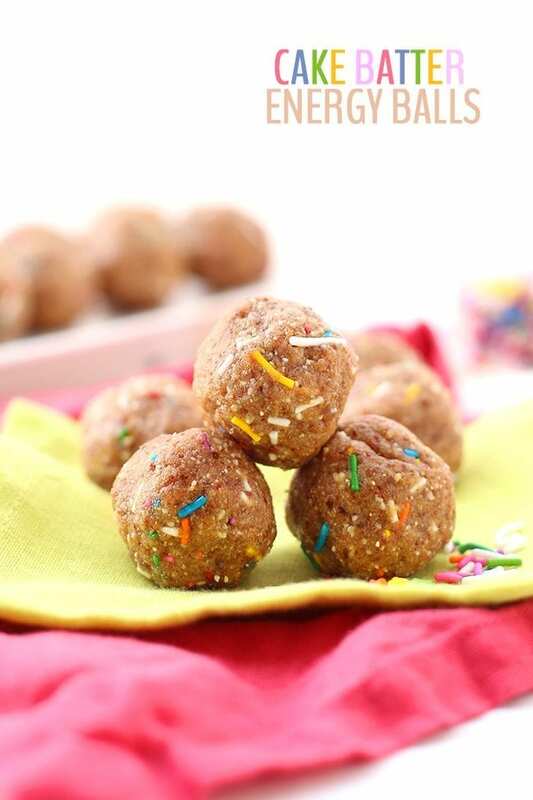 I don’t want to pick favorites, but if I were in a life-or-death situation and had to choose my ultimate energy ball recipe from this week, these cake batter energy balls would totally take the cake (see what I did there?!). Never before has C ever declared that another energy ball recipe is on par with the Blueberry Muffin Energy Ball recipe if that’s any indication of how good these are. That being said, anything with sprinkles will always win out. 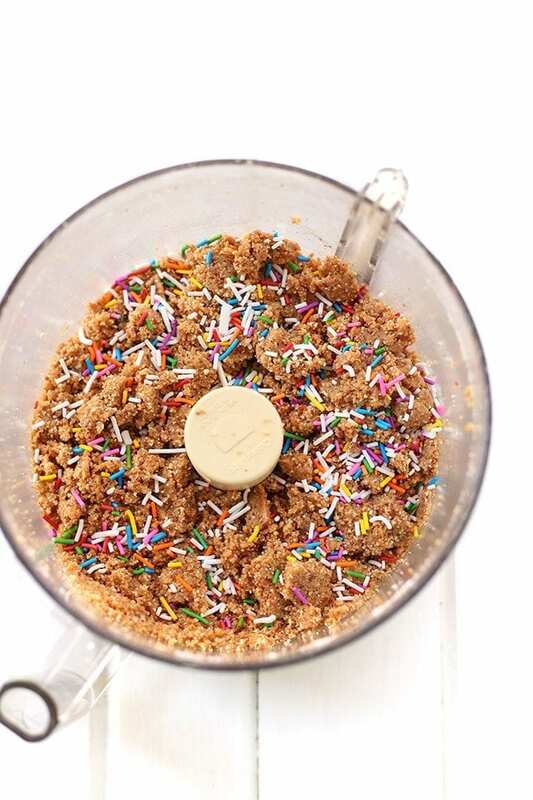 Sprinkles certainly do not make the list of healthy ingredients (they’re basically pure refined-sugar with food coloring), but we all need to live a little every now and then. I think it’s this sentiment that your life can’t be driven by broccoli and green juice that brought Lee and I together and has ultimately solidified our friendship. By now, if you don’t know who Lee is you probably landed here without knowing it’s Energy Ball week, have never read THM before or have been living under a rock. 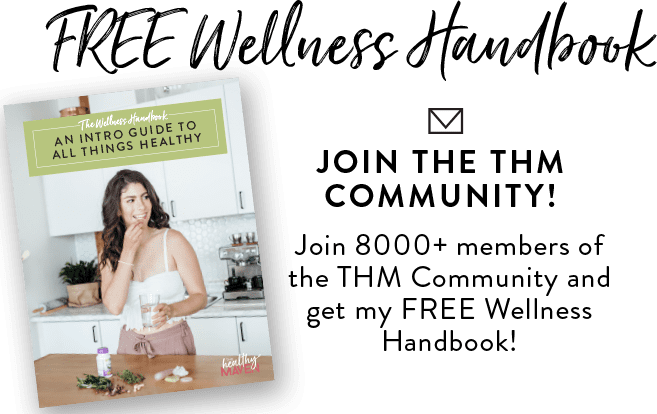 If you’re an avid reader of THM then Lee is old news to you. 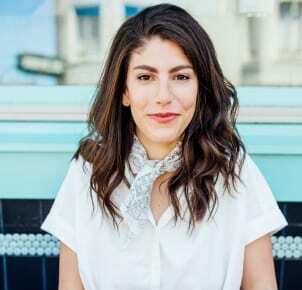 By now you know she’s my best friend, blogging partner-in-crime, energy ball-obsessed mentor and just all around my go-to girl. I chose today’s recipe in honor of our two-year anniversary. Yes, we have an anniversary and yes, we feel the need to eat cake to celebrate it. Technically, Leanne Debra Hersh and I met on October 20, 2013 (two weeks from now) and for those of you who haven’t heard the story, please enjoy. As already discussed, our friendship began well before Lee knew I existed. I was the ultimate fan-girl of Fit Foodie Finds (which was then called College Foodie Finds). I followed along through Lee’s Minneapolis adventures, ball recipes, and yes, even her OG youtube videos (good luck finding those). Lee entered my life around the same time C did and that solidified my fascination with Minnesota. Years of commenting (me commenting on Lee’s blog) pre and post the establishment of THM eventually led to the fateful day in which we met. I was visiting C’s family in Minnesota and decided to comment on the muffin recipe Lee posted on Instagram that I could “smell them from Edina!” Lee for whatever reason was not completely freaked out by my comment and proceeded to ask if I was visiting Minnesota and if so if I wanted to meet up! I nearly wet my pants over meeting my blogging idol (exaggeration – Lee don’t get a big head) meanwhile Lee was struggling with how to say my name. Long story short, we met up at a local starbucks, which turned out to be 2 blocks from her house and from C’s parents house in Edina. We eventually determined that Lee and C’s parents were basically neighbours oh and that we are blogging soulmates. 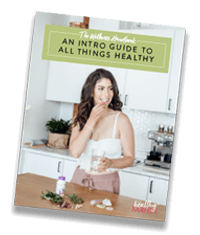 Lee and I had both met a lot of bloggers who we liked but never felt all that connected to in terms of our mindset when it comes to health and also our desires to turn out blogs into our careers. From that day on Lee and I have pretty much spoken everyday. We joke that we both swiped left on Tinder and our friendship was born. So today I raise my Cake Batter Energy Balls in honor of my girl Lee! I hope everyone can experience the awesomeness of having a badass, ladyboss, ukelele-playing, secret potty-mouth sporting, beauty queen best friend. Add coconut to food processor and process for 5 mins, scraping down the sides as needed. Alternatively, skip this step and use a 1/4 cup of coconut butter – not coconut oil. Add in dates in process until broken up into pea-sized bits. Add in cashews, sea salt, vanilla extract and whey protein. Process until all ingredients come together. Mixture is done when you can roll dough into balls and they hold their shape. Add in sprinkles and pulse several times to combine. Roll into 18 balls and place in the freezer for 15 mins. Store in the fridge for up to one month. Do you have a best friend? How did you meet them?! Anyone else meet their best friend online? UGH I just want to swan dive into a giant pool of these. That would actually be a dream-come-true! I feel like I’ve previously read about the details of you and Lee connecting, but loved reading about it again. Crazy how best friends are born, right? The one girl I feel I go to with anything and everything, I met through my CrossFit gym. We’ve been besties ever since meeting and just “get” each other. Our personalities are pretty similar and we approach our lives in the same manner, which obviously helps with a best friend! Such a cool story of how you met. 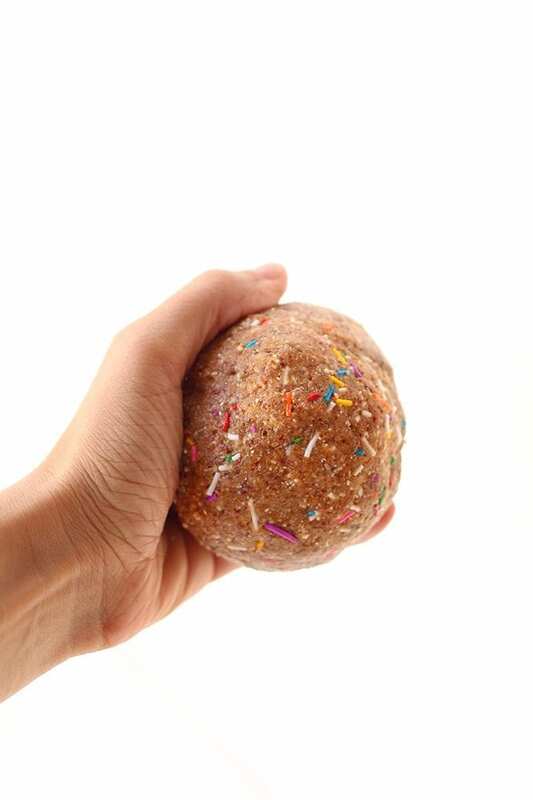 These balls looks so fun, the sprinkles do make them a bit festive. 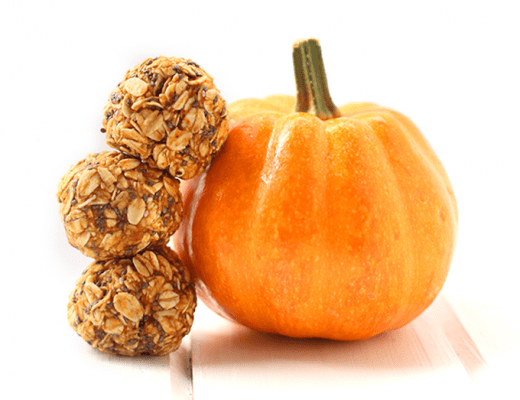 It would be great for a healthy snack at a kids birthday party, I think children would love these. I totally agree! They’re like birthday cake donut holes! I saw cake batter and I came running! Yes, it is only 7:45am but I just made these and may not need another meal today. So good! Ah I’m so happy to hear that!!! So worth eating all day! I would use 100% Whey–Vanilla (EAS brand) so that is what I based my calorie count on. These do look great. I have been a fan of these, but in bar form. Next time I will mold them into balls which saves the rolling pin and cutting steps. 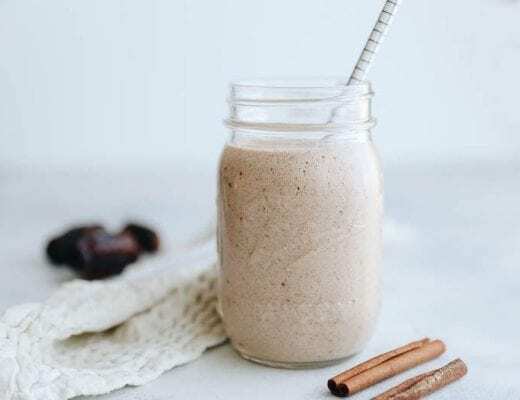 One question though… What kind of whey protein do you use in your recipe? I like organic, so even though I do drink protein drinks I try to stay away from artificial ingredients. I used an organic whey brand but it’s only one scoop and truthfully it’s for flavor rather than the protein boost. The nuts also help increase the protein naturally. Click the link for the protein powder and you’ll see which one I’ve been using. Truthfully I don’t looooove it but for such a minuscule amount it does the trick! ummmmm gromance?! Greatest word I discovered today! 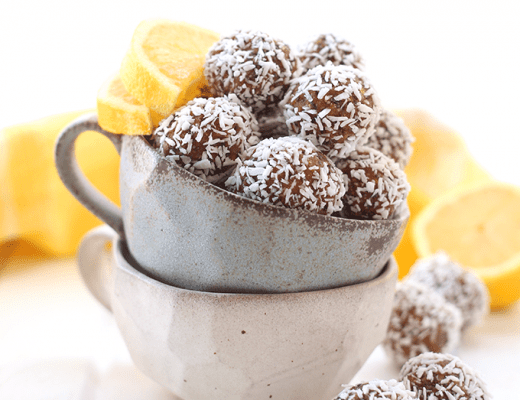 These are perfect for when my afternoon sweet cravings hit! 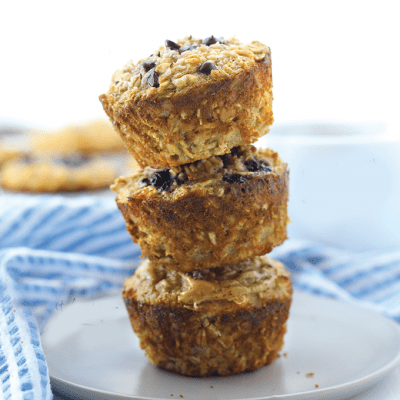 I love that they are made with all natural ingredients and are super easy to make! that’s awesome! I’m still close with my middle-high-school friends 🙂 Also yesssss to all things cake batter! These look amazing! My best friend and I were running partners! I love anything cake batter! But, I absolutely cannot stand coconut. Is there anything else I can use ? Thanks! Hi Christina! Unfortunately no 🙁 It’s really the combo of coconut + vanilla, which creates that cake batter effect. I don’t personally find it to be coconutty at all. To be it tastes like cake batter! Wish I could help! I made these for my son’s school snack, but substituted chickpeas for the cashews as school requires all snacks be nut-free. He tried them today for the first time and LOVED them! We have a winner! Kid-approved! 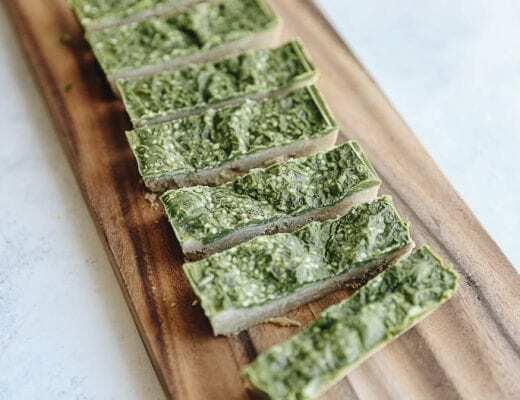 Thanks so much for the great recipe – it’s sure to become a staple for school snacks, and on-the-go munchies, especially with summer day trips and camping adventures coming up!